Finally, an Awesome Backgrounds Bible! One of the great publishing delights of 2016 is the NIV Cultural Backgrounds Study Bible. Zondervan, of course, is the publishing house. The NIV 2011 is the translation employed, one that is faithful to the meaning of the Greek and Hebrew and communicates clearly to English-speakers of the 21st century. This is truly a landmark publication; the subtitle says it all: Bringing to Life the Ancient World of Scripture. The dense, nearly 2400-page Bible is packed with notes, graphs, photographs, sidebars, tables, charts, maps, and cross-references. It would be difficult to find two more qualified general editors than John Walton and Craig Keener. These two scholars live this stuff. They are giants in the field. Kudos to Zondervan for signing them on for this project. Their names alone are a solid recommendation of this Bible. Virtually every page brings fresh illumination to the text of Holy Writ. The NIV Cultural Backgrounds Study Bible makes accessible the best of evangelical biblical scholarship. This should make a terrific Christmas present for just about anyone on your list. You can order your copies here: http://media.harpercollinschristian.com/page/cultural-backgrounds-study-bible. See blog by Michael Bird here. Weigh in on this yourselves. I encourage you all to write to John Kutsko, SBL Executive Director. Gregory-Aland 1761: A Gospels Manuscript? We have a team from CSNTM working at the National Library of Greece in Athens this summer. A big team—from seven to nine people at any given time. The work is both exhausting and exhilarating. Handling precious documents all day long, while trying to produce accurate, aesthetically-pleasing photographs, can be emotionally draining work. But every new day the teams are ready for more. One of my tasks is to count quires. A quire is, medievally speaking, eight leaves or four double-leaves (bifolia) laid down, then folded vertically in the middle. These leaves then form a quire and they are sewn into the binding at the crease. Some scribes numbered their quires by writing, in very faint and small ink, the number of the quire on either first page (recto) or last page (verso) of a quire. Then, when it came time to stitch all the quires together they would know what order they would go in and assemble the book. But not all scribes wrote out these quire numbers, and even for many who did later book-owners trimmed the pages, inadvertently cutting off either the entirety or a portion of the quire number. And often, they wrote in red ink—the kind that fades so badly that it is now invisible. There are three ways to identify the number of leaves in a quire quickly: (1) notice and document where the quire numbers are; (2) notice where the sewed strings are (always in the middle of the quire); and (3) feel the pressure of the leaves—if a leaf wants to go to the left, it belongs with the previous quire; if it wants to lay flat, it begins a new quire. There are problems with each of these methods, but it’s essential that the quire counts are done while examining the manuscripts instead of via photographs since the latter approach eliminates the third method for determining quire counts. The binding may be tight, and the strings won’t show up in the photographs, which makes approach #2 difficult to accomplish. Frequently, a magnifying glass is used to determine if the strings are there, but this of course can only be done while examining the actual manuscript. Gregory-Aland 1761 posed an interesting problem. It’s a manuscript of Acts, the Catholic letters, and the corpus Paulinum (including Hebrews). The first quire reveals no number, but quire 2 has the number κε or 25. The numbers are then seen on every quire and they are in sequence without any gaps, going all the way through μθ or 49. Only one leaf is missing in this entire manuscript, which is unusual. Normally, at least a few leaves are missing from a manuscript, even one as late as the fourteenth century (the date of GA 1761). Since the Institut für neutestamentliche Textforschung in Münster, Germany is the de facto cataloguer of the Greek NT manuscripts, they list this manuscript as an “ap” document—that is, Acts and Catholic letters (a) and Paul (p). They do not indicate that anything is missing, although one leaf is absent. However, judging by the quire numbers far more than one leaf is missing—184 leaves to be exact! 184 leaves is the number for the first 23 quires (since the second quire in the extant manuscript begins with ‘25’). What was originally in this manuscript? One’s immediate hunch would be all four Gospels, and that turns out to be correct. With an average of 360 words per leaf in the extant manuscript, 183 leaves would be required for the Gospels. Thus, this manuscript was originally an eap, with ‘e’ standing for evangelists or εὐαγγέλιον. 1.1–8, 2[κε].9–16, 3[κς].17–24, 4[κζ].25–32, 5[κη].33–39 [short quire], 6[κθ].40–47, 7[λ].48–55, 8[λα].56–63, 9[λβ].64–71, 10[λγ].72–79, 11[λδ].80–87, 12[λε].88–95, 13[λς].96–103, 14[λζ].104–111, 15[λη].112–119, 16[λθ].120–127, 17[μ].128–135, 18[μα].136–143, 19[μβ].144–151, 20[μγ].152–159, 21[μδ].160–167, 22[με].168–175, 23[μς].176–183, 24[μζ].184–191, 25[μη].192–199, 26[μθ].200–207. Rest is paper MS added later. 102a: subscription: written from Corinth through Phoebe; stichoi mentioned. The work at the National Library progresses well; we will soon wrap up our first of two summers here. 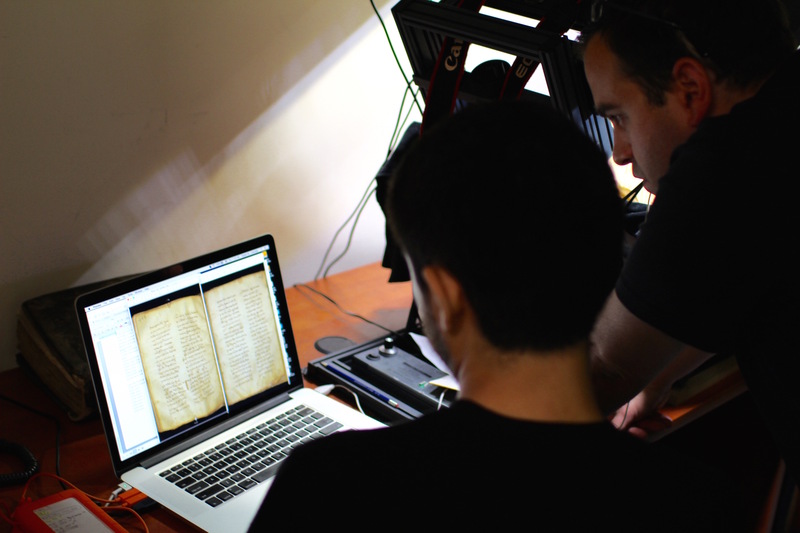 And in the end, we will provide approximately 150,000 high-resolution images of c. 300 manuscripts and over 700 pages of documentation. When all the manuscripts we are digitizing at the National Library are photographed, we will post them on csntm.org, along with all the prep docs. This has been our custom since the beginning, though CSNTM continues to refine its digitizing standards and prep doc information. A New Gospel Manuscript in Athens? 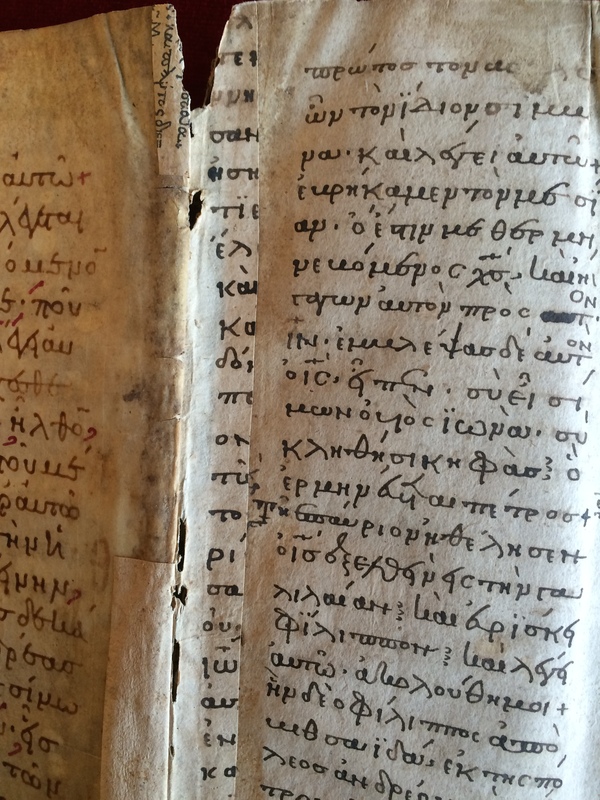 In my last post I mentioned a newly discovered apostolos manuscript, found glued to the inside of the front and back covers of a codex (NLG 2676). This blog is about another manuscript inside another codex. This time the codex is Lectionary 1816, a 12th century parchment manuscript of the Gospels with 154 leaves. The National Library of Greece in Athens assigns it the shelf number 2711. The new discovery, however, is not a couple of leaves glued to inside of the covers; rather, it is several reinforcing strips glued to the inner margin of bifolia (double-leaves) near the beginning of the codex. The reinforcing strips are from a parchment manuscript which was a two-column text. It was probably written in the 12th or 13th century. The strips are found on bifolio 2a–5b, leaves 2b–3a, leaf 4a, leaves 4b–5a, and leaf 6a. Some of the strips have only one or two letters of material per line, while others have as many as six letters per line. One of the strips is at the beginning of the line, revealing the initial letters on each line of the column. So far, sections from Luke 1 have been identified. One section is apparently from Luke 1.57–61. The image is below. Please excuse the formatting of the above reconstruction. I think you can get the idea though, especially since these letters are at the beginning of a new line. For 17 of the 21 lines, the text is clearly from Luke 1.57–61. And there is no other text that even comes close. It surely must be that this is that passage throughout the strip. The average line (not counting lines 5, 14, or 21 since their quantities are unknown) is 17 letters long, running between as low as possibly 13 up to 19 letters. But four lines are a puzzle. First, line 2 has γειν for κειν(? )—in τεκειν, an unattested reading. Second, line 5 begins with ἠση. Whether this is one word or two is not known, but either way it does not fit in with Luke 1.58 at all. What should be on this line is οι συγγενεις αυτης ο-. The smooth breathing (ἠ) indicates the beginning of a word, which eliminates the possibility (remote as it was anyway) that the scribe’s eye skipped over a column or two of the manuscript of his exemplar and wrote ηση (the end of κληθηση in Luke 1.76). Further, whatever he is doing, he seems to pick back up with the οτι of 1.58, since it is split over two lines with the τι beginning line 6. Another possibility that should be ruled out is a spelling change: although οι and η sounded alike in this era, as did υ and η, it would be both completely unattested and not in character with the rest of this strip for the scribe to have written ἠ σηγγενεις instead of οἱ συγγενεις—a double misspelling! This solution simply looks too convenient to be convincing. The breathing, however, is not a problem since medieval scribes routinely mixed up the smooth and rough breathings. Third, line 10 is unusually short, with only 13 letters. Now, it is just possible that the scribe wrote εν τη ογδοη τη ημερα over the two lines. This is both unattested and a nonsense reading, but the repetition of eta in four words successively might have caused a kind of dittography. This would bring the line to 15 letters. Alternatively, the scribe might have added εις το before the infinitive on this line, thus creating an 18-letter line. But this, too, is unattested. Fourth, the 14th line seems to have had only του Ζαχα- on it, for the ρι that begins line 15 has the acute accent, indicating that it is part of Ζαχαρίαν rather than αποκριθεισα—which in any event is unlikely both because of the disruption this would cause to the surrounding lines and because of the very unnatural word break. But if line 14 only has του Ζαχα-, it is a seven-letter line. Why so short? One could understand line 14 ending with Ζαχαριαν, since the next verse could begin a new section. But why break the last word of v. 59 over two lines? For these four problems, I have no ready solution. I hope that one or two of the readers of this blog will be able to offer an explanation to these conundrums. There are 29 extant double-column Greek New Testament manuscripts from the 12th to the 14th century with Luke in them, only five of which are lectionaries. Most likely, this is the 30th such manuscript and probably a minuscule rather than a lectionary (based strictly on statistical probability). When all the photographs of the strips in NLG 2711 are made available, surely more text will come to light. Perhaps the other strips will also resolve some of the issues we have already mentioned, and help us come to firmer conclusions about what, exactly, this manuscript is, and why especially it deviates from Luke 1.58 so radically at one point.